I aimed to get up at an ungodly hour this morning and head to northeast Kent. However, with another torrid week at work, the alarm just wouldn't get me up. 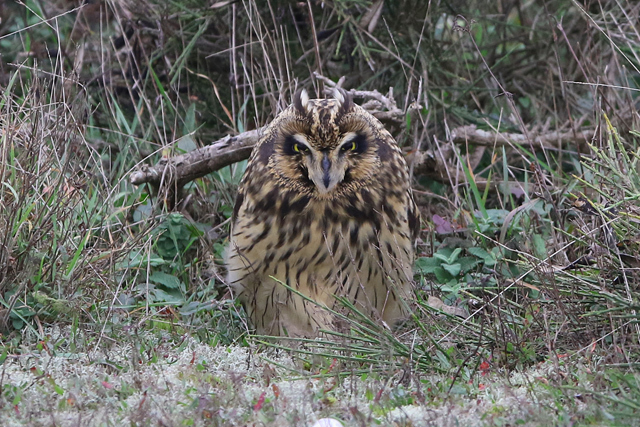 And so what happened was a mid morning arrival at one of my more usual spots, Dungeness. With a pretty nippy northerly wind, working Dengemarsh gully was hard work - a Northern Wheatear, more than a handful of Chiffchaffs and a fair number of Goldcrests. All nice for a Saturday morning saunter, but without anything even on the semi-scarce scale. And so it was round to the fishing boats as usual, and with Mick S sunning himself in Portugal, it was just me and Richard S with the gulls. Our gulling time was cut short though, as Martin C informed us that there'd been an influx of Short-eared Owls (which included one that had unfortunately come to an abrupt end). Mid afternoon in the desert area was amazing - at least six of them, obviously tired and out of place from their recent sea crossing. And though as a kid I was used to some nice views of them at high tide at Parkgate, some of the views I had here were incredible. Really happy to have been down at Dunge when this happened. And to the gulls. There were lots of them, including two adult Yellow-legged Gulls which were a bit of a surprise given it'd been a good couple of months since I'd seen any of this age here. The only rings of note were four Norwegian/Danish Great Black-backed Gulls, three of which I'd seen before (including one 5 times) and one new adult. 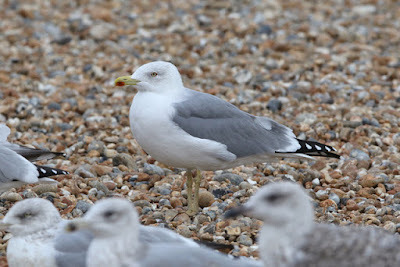 But there were, unlike last weekend, no Caspian Gulls which was a shame. You can't have everything though.